Image you have a blog which contains a lot of nice articles. You put ads at the top of each article and hope to gain some revenue. After a while and from your report, you see that some posts generate revenue and some do not. 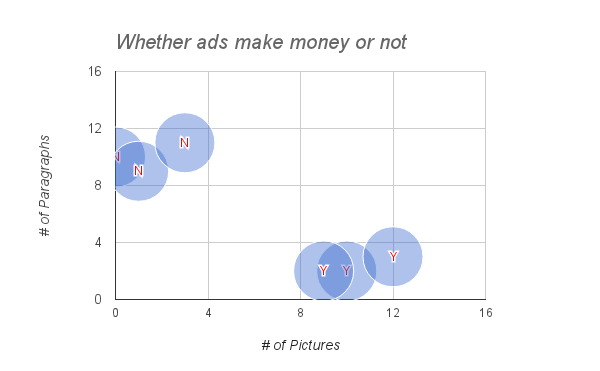 Assuming that whether an article generates revenue or not depends on how many pictures and text paragraphs in it. we can plot them in the figure below. How K-Nearest Neighbors (KNN) algorithm works? When a new article is written, we don't have its data from report. If we want to know whether the new article can generate revenue, we can 1) computer the distances between the new article and each of the 6 existing articles, 2) sort the distances in descending order, 3) take the majority vote of k. This is the basic idea of KNN. Now let's guess a new article, which contains 13 pictures and 1 paragraph, can make revenue or not. By visualizing this point in the figure, we can guess it will make profit. But we will do it in Java. kNN is also provided by Weka as a class "IBk". IBk implements kNN. It uses normalized distances for all attributes so that attributes on different scales have the same impact on the distance function. It may return more than k neighbors if there are ties in the distance. Neighbors are voted to form the final classification. what if i got input and get its nearest neighbor what should i do ??? actualy please tell me what is the actual process behind this . and how we get this output? When running this example I get output 0.0 for both first and second, what’s the deal with that? Also, like Juan, it would be interesting to know exactly what the output means. THIS IS NOT WHAT PEOPLE LOOK FOR! What does the output exactly mean? Is it related to the revenue of the new article?